Having hired campervans before in the UK, Norway, the USA and New Zealand I had fairly strong views on what I did and did not want. 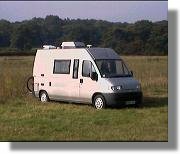 I wanted a maneuverable two person van that could be comfortably driven in small towns and villages, that was built to last, was secure and was not decorated in the "glass and brass" style so beloved of some UK campervan designers. After a lot of searching I selected a van conversion (rather than a coach-built) based on the Fiat Ducato 14 van built by Murvi in Ivybridge, Devon, UK. Base vehicle: Fiat Ducato 14 LWB High Roof van with 2.8 litre turbo diesel engine, in metallic steel grey. Insulation: 30-40mm Rockwool in roof, 9mm MDF floor, carpet trimmed side walls. Blinds/Curtains: Integral Seitz blinds and fly screens. Electrics:3 x 13amp sockets, 2 x 12volt sockets, Zig controller and two leisure batteries as well as vehicle battery. Cooking: Smev four-burner hob and microwave oven (mains only). Sink and drainer: Stainless steel. Water system: Fresh water 75 litres, waste water 35 litres. Heating: Eberspächer diesel powered Max 4Kw/0.51 litres per hour. Air-conditioning: Electrolux roof mounted CAL61 (mains only). Cruising speed: 120 kph (70 mph). Fuel consumption: 15 litres/100km (29 mpg). The Murv is great in the sort of conditions that let you have the huge side door open onto a wonderful view. So far almost everything has worked perfectly and the few problems there have been have been fixed by Murvi very quickly. Strongly recommended. Murvi Motorcaravans Ltd., 4 East Way, Lee Mill Industrial Estate, Ivybridge, Devon, PL2 9GE, UK. Phone +44/0 1752 892200. Although it is obviously better to have a real live navigator there are times when it is necessary to drive the Murv alone. As I find getting lost in a big city whilst driving a van on the "wrong" side of the road is far from fun I have equipped the Murv with a GPS system. 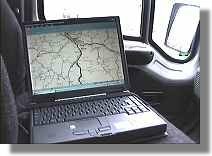 This in conjunction with my laptop computer and Autoroute Europe provides a usable satellite navigation system. You still take the wrong turning but it is far less stressful! The laptop (a Gateway Solo) is held down to the passenger seat with a velcro strap and the GPS system's antenna is fixed to the inside of the skylight. With Autoroute running the system works reasonably well. You quickly discover that digital road maps are not very accurate and the location of camp sites is a bit arbitrary, but it helps a lot. This page was created and uploaded to the Internet from a lay-by in Spain via a GSM phone whilst killing time waiting for the Bilbao to Portsmouth ferry.